Rounding out our week of making romantic meals by cooking with aphrodisiacs, here’s one inspired by “Lady and the Tramp.” It’s Week 14, Meal 3: Whole wheat spaghetti Pomodoro with turkey meatballs and shaved Parmesan. First, prep the ingredients for the sauce. Drop the small dice on 1 small carrot, 1 stalk of celery and 1 onion. Mince 1 clove of garlic and chop 2 t each of rosemary and thyme. Heat 1 T of olive oil in a large pot over medium-high heat. 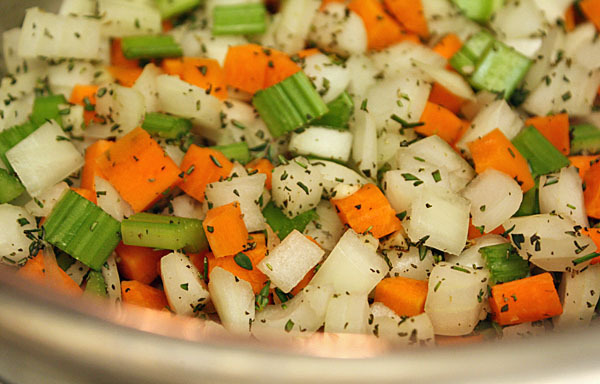 Add veggies and herbs, and cook until the vegetables soften — about 5 min. 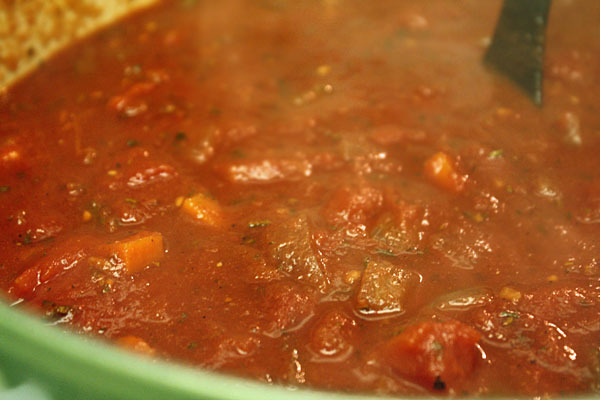 Add 1 T of tomato paste and stir well to coat the veggies, until you see the paste start to caramelize on the bottom of the pot. Then, deglaze with 1/2 c of red wine. Add 1 28 oz. 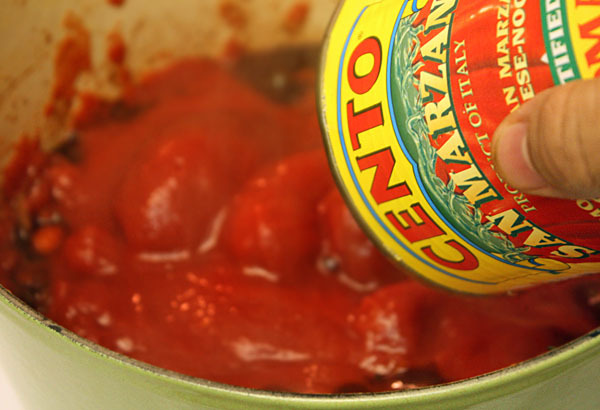 can of San Marzano tomatoes and reduce heat to a simmer. Cook for about an hour to let the flavors meld and then season with salt and pepper. 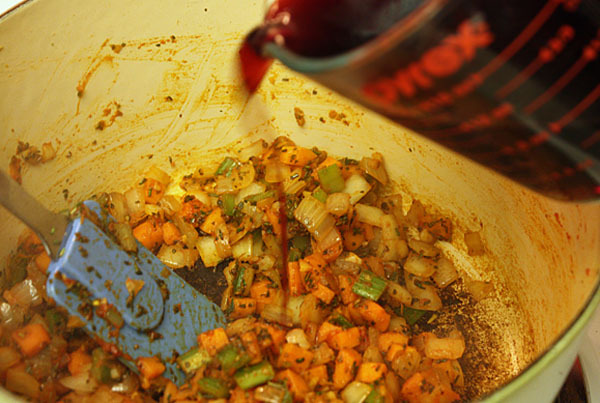 Once the sauce is done, run through it with a stick blender, or puree the sauce in a blender (do not overcrowd the blender if the sauce is still hot or it will explode — and that’s writing from experience). This would be the time to grab a pot to cook the pasta in. 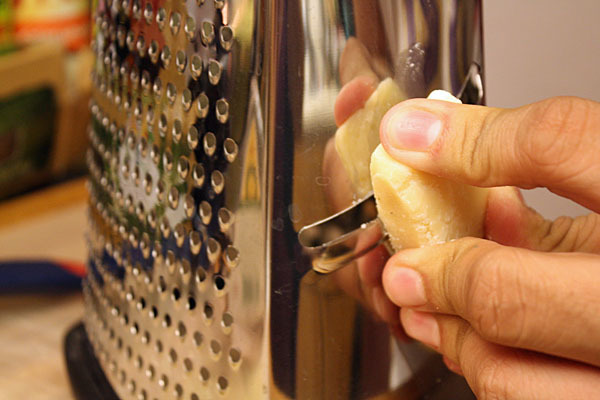 Make sure to salt the water as a way of flavoring the pasta. 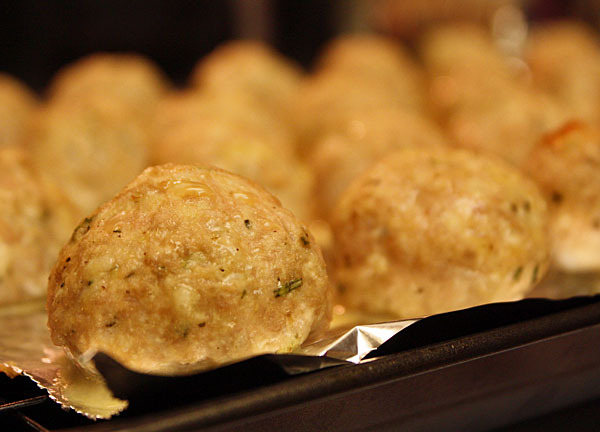 While the water is heating up, make the meatballs. In a large bowl, combine 8 oz. 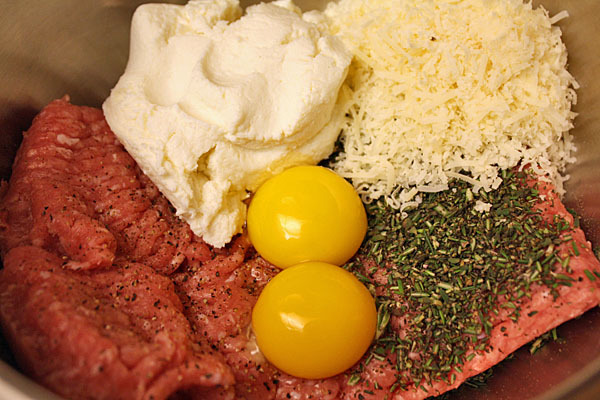 of ground turkey, 1/4 c of part-skim ricotta cheese, 1 egg yolk (I doubled the recipe, as you can see), 2 T of grated Parmesan cheese, 1 t each of chopped rosemary and thyme, and salt and pepper. Roll the mixture into 1 oz. balls (should make 10-12). You can either cook them by simmering them in the sauce for the full hour, or you can oven roast them at 400F for 10 minutes. I roasted mine so I’d have the extras on hand for whatever else I wanted to do with them. 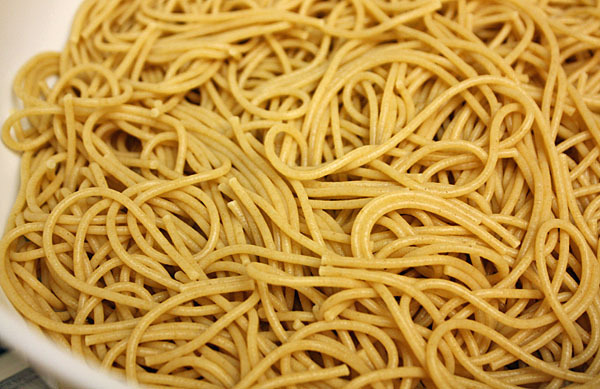 While the meatballs are cooking, boil 2 servings of whole wheat spaghetti according to the package directions. 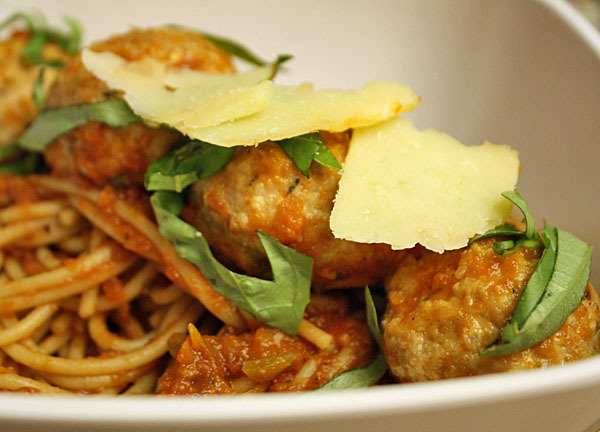 To plate: Split the pasta servings, top with 1/4-1/2 c of sauce and half of the meatballs. Garnish with a few Parmesan shavings and a couple of thin slices of basil. Then, you know, since we’re talking about aphrodisiacs (turkey, ricotta cheese, tomato, red wine, basil, rosemary) the only logical thing to do after eating is … well … this is a family-friendly blog. Just let those aphrodisiacs do the work! I had planned to make bisketti for dinner tonight, but I think I might have to change recipes now and try Chef Brian’s. Looks delish! If you do, lemme know how you like. Love the addition of ricotta to the meatballs. Great for the lean turkey. Brilliant.